Knitterpated: Yes, I Still Knit. Occasionally. Yes, I Still Knit. Occasionally. My knitting has taken a back seat to spinning and felting in the past month, but I have been working on a few small projects. Here is my tote bag after I returned from knitting group this morning. 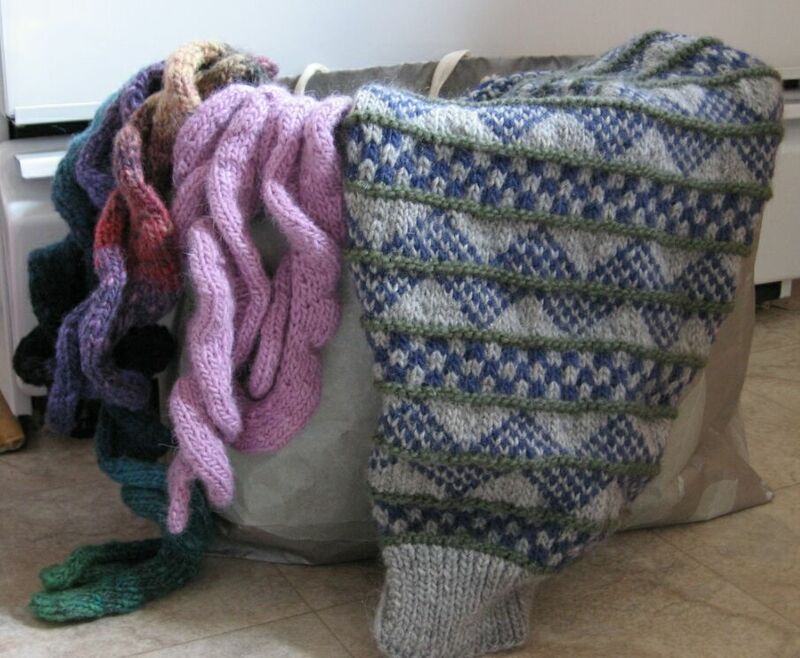 On the left, you can see two new Ruffles scarves, one made from Noro Kureyon and one made from Frog Tree alpaca. Both of these are late holiday gifts that will be mailed out on Monday! I had never knit with this alpaca yarn before, but the colors are gorgeous and it is reasonably priced, so I would recommend it for gift knitting. Also, I think I read somewhere that the fiber is produced by a women's cooperative? Must google that at some point. On the right you can see the final sleeve of the Evil Sweater. (You know, the one I started making for DH in 1997.) I am so close to finishing it (body is done, most of the sleeves are done) that it seems silly to let it languish any longer. I am not that into it. Which maybe you could tell, since I have barely worked on it since 1998. But I have told myself that I can't enter the Knitting Olympics unless I get at least one UFO off the needles, so perhaps that will provide some much needed motivation. I met a new woman at knitting group today, and she is an avid blog reader, so I owned up to having a blog. (Hi Linda!) She and I chatted about the blogs we read, and the Knitting Olympics, and we shared insider blog jokes while the other knitters stared at us in bewilderment. They know not what they are missing.